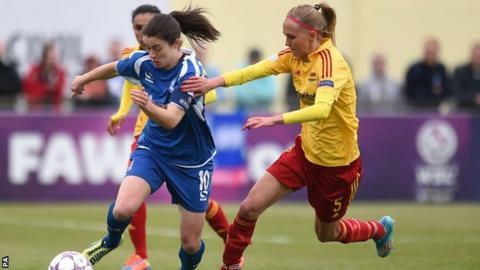 Birmingham City could still become the second British club to reach the Women's Champions League final after a battling goalless draw in their semi-final first leg at home to Tyreso. Brazilian striker Marta sent a low shot inches wide for the Swedish visitors. But Birmingham kept a sixth clean sheet in seven Champions League games, while Remi Allen and Mel Lawley went close for City before Jade Moore shot wide. The second leg takes place in Sweden on Sunday, 27 April. In front of a 1,580 crowd at Damson Park, the Blues were on the back foot for long spells but ended strongly. Matching Arsenal's feat of winning the European title in 2007 is still a long way off, but manager David Parker said: "I'm confident that we'll get a goal over there, and if we defend as well as we did today we can beat this team." Parker added: "We started poorly and had to address that, but then we really grew into the game. I felt we were the better side in the second half and we could well have got a goal. That was a magnificent performance." Although Parker's team defended well they were also guilty of some mistakes that could have proved costly in the opening half-hour. Central defender Kerys Harrop's dallying on the ball was almost punished by Marta, before midfielder Jo Potter lost possession and Veronica Boquete fired an 18-yard effort into the side-netting. And on the half-hour it took a tremendous block by central defender Aoife Mannion to prevent striker Christen Press' 12-yard shot from finding the net. Blues improved after the break, and although goalkeeper Rebecca Spencer had to make a great diving save from Marta's 63rd-minute 30-yard free-kick, the home side looked the more likely to score in the closing stages. Captain Karen Carney said: "We didn't have enough belief today, but after that second half performance we know we can go to Sweden and win."